This was the second outing of my beloved plastic Perry WotR figures, painted in the livery of one of the Percy family, with six lovely Foundry crossbowmen with 1st Corps Pavisses. Once again we were facing Ian’s Foundry Nevilles in different liveries. Lawrence had just finished a small unit of Perry Plastic WotR archers in Lord Faulkonbergs (sic) livery. The terrain was once again Lawrences lovely trees and hills with his multi-period use tavern. The terrain was based around a rough road with hedging along the edges which would have looked right in the Bocage in Normandy! ... though nearly half deployed rather disingenuously behind the tavern, hoping to ambush my Lancastrians if they came down the road to outflank the visible Yorkist troops. A small body of ‘Pricker’ cavalry with a Knight leading was deployed on the road - assumedly to intimidate the indiginous wildlife. My longbowmen were in no way impressed! My Lancastrians deployed in 2 bodies, a light force deployed behind a small knoll and in some rough ground on the right, with the remainder deploying to the left of the road. The Lancastrians rapidly moved to engage the Yorkists on the hill and over the next few turns the Yorkists took rather the worst of the engagement and took several ‘breathers’ on the reverse slope of their ridge. The Lancastrians on the road and the knoll were taking casualties too, but stood their ground. The Percies were eventally confident enough for their archers to start flanking the Yorkists on the hill. So what was happening to the Yorkists behind the tavern? They waited in vain for the Percies to come up the road – the Lancastrian plans to scout in that direction having been scuppered by the difficulty their comrades were having shifting the Yorkist archers off their ridge. With Lancastrian casualties mounting from the arrow battle, every bowman was needed to engage them. Eventually, the ‘hidden’ Yorkists emerged and crossed the road to attempt to outflank the Lancastrians on the road ‘a la St Albans’. 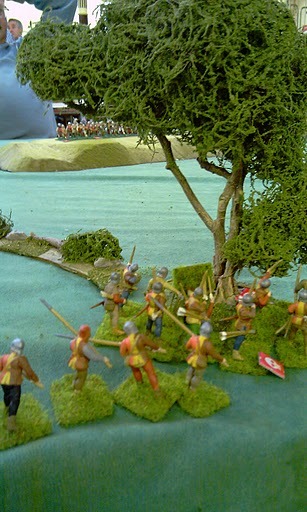 Some of the Lancastrian armoured archers were forced to turn and trade arrows with them, fortunately they were helped by the main Yorkist body falling back for another breather – allowing some of the other Lancastrian roadside archers to add their shooting against the Yorkists crossing the road. The Lancastrians left in the road now had to stand and take fire from 2 directions. Luck was with the Lancastrians (and probably the prevailing wind!) as they again began to win the shooting match. 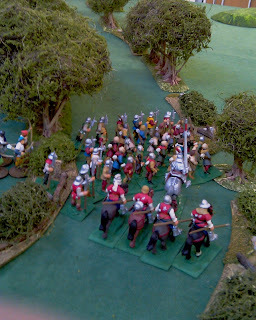 With the Lancastrian Men at Arms advancing, their archers having suppressed the Yorkist shooting to a great degree, the Lancastrians decided to withdraw from the battle. As usual in these battles, and in this one too, the only way of achieving decisive victory would have been for the combatants to come to hand strokes. The Lancastrians, on balance, would have been happy to gain the ascendancy they did however. Their losses, particularly amongst the unarmoured archers were bad enough to make them shy of taking more without good cause!